Sonic The Hedgehog's Future: Now What? Sega's mascot is riding high. Let's see if he can stay above the clouds. Sonic Generations is the result of 20 years of video games comprised of many different concepts, characters and worlds. It serves as a fun homage to one of the greatest mascots in history, and proof that Sega is more than capable of drawing upon the same magic that captivated fans in 1991. 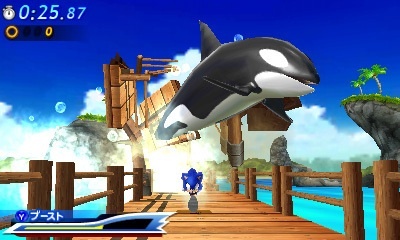 Sonic Generations 3DS has issues, but the console game is very good. As much as we enjoyed Generations, at least the console version, its existence does beg the following question: Where does Sonic go from here? Sega finds itself in a good position. The past ten years have been brutal for the blue blur, who proceeded to star in one dud after the other. Then the publisher broke through with Sonic Colors, followed by this year's adventure. Finally, there's reason to hope. That is, unless Sega drops the ball again, resorting to cornball gimmicks (A werehog? Really? ), bizarre love stories and titles plagued with glitches. Thankfully, it doesn't have to be this way. 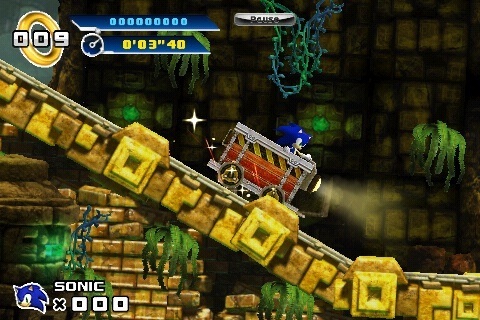 Sonic CD, one of the most celebrated Sonic games in history, will appear on iPhone and iPad before the end of the year, so there's a great opportunity to end 2011 on a high note. What's more, we should learn more about and play Sonic the Hedgehog 4: Episode 2 in 2012. Critics argued that Episode 1 was plagued with poor physics. Well, that doesn't need to happen here. Sega can easily right that ship. We also expect the company to roll out a brand new Sonic experience for Xbox 360 and PlayStation 3, one that builds off the foundation laid in Generations, but without Classic Sonic. The little guy deserved to make a comeback, but his time has passed, and Modern Sonic's levels were far more exciting. Announce a 3D game filled with those types of stages and we'll pre-order immediately. Sonic 4: Episode 1 was good. Can Sega top that with Episode 2? At the same time, go back to the drawing board and create a more feature packed Sonic title for 3DS. The portable Generations was a far cry from the high quality we've come to expect from handheld Sonic games. The system is capable of so much more than what Sega ultimately delivered. Meanwhile, the developers would be wise to avoid whacky spin-offs. Both consumers and critics reacted favorably to Colors and Generations. The blueprint for success is right there on the table. Just give everyone more of the same with subtle tweaks, and things should work out fine.